Tokyo Vicinity.  Click prefecture name to see list of museums in that area. 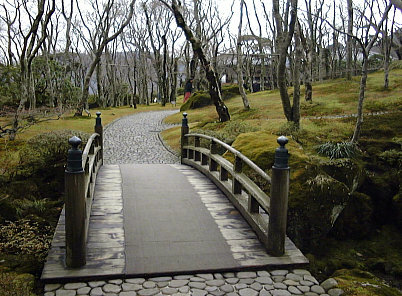 Hakone is a famed hot spring resort area located about an hour outside of Tokyo. It's a beautiful mountain region with an abundance of volcanic activity that keeps the underground water bubbling up piping hot, which in turn, keeps the thousands of yearly visitors toasty warm. Besides soaking in the healing waters there are quite a few attractions, one being the Hakone Museum of Art. Unlike other art museums that house a wide variety of art objects, the collection here consists of pottery only. 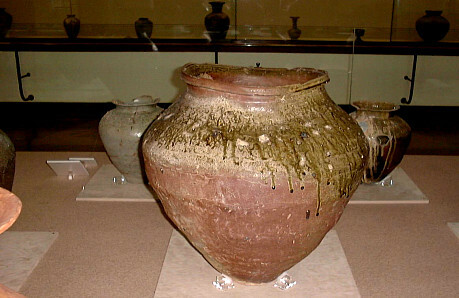 More specifically, pottery dating from the Jomon period (10,000 - 300 BC) through the early Edo period (1603 - 1868). For more details, see the Timeline in our Guidebook. 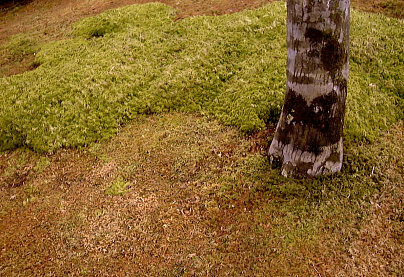 As one enters the museum grounds, a lovely moss garden unfolds. Indeed, forty or so species of moss are carefully attended to by the staff. It's quite an enchanting garden surrounded by maple trees and well worth strolling through. Yet the focus on coming here is pottery. 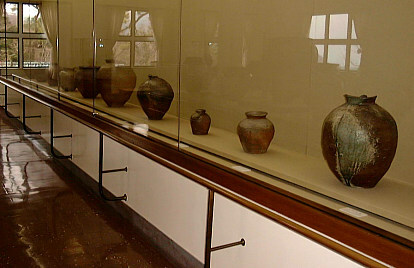 The main two-story building has two galleries on each floor that feature in chronological order a look at some mighty fine pots. The collection was amassed by Mokichi Okada, who established the museum in 1952 to house it in. In 1982 a large portion of the collection was moved to the modern MOA Museum in Atami that is now world famous. The pots stayed behind in tranquil Hakone. 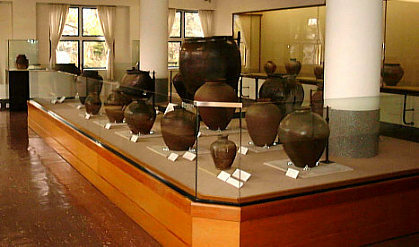 The first room (above photo) is filled with a center cluster of Jomon pots along with some fine examples of Haniwa figures, Yayoi (300 B.C. to A.D.300) and Tokoname tsubo jars (below photo). 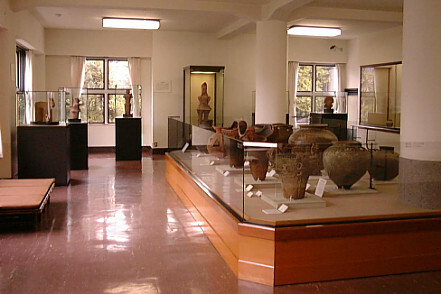 The large Haniwa figure in this room is designated as an Important Cultural Property by the government (below photo). Around the room in the glass cases are pots known as sueki (below) and these were the first high-fired wares that allowed the pots to be 'sealed' and thus hold water without leakage. 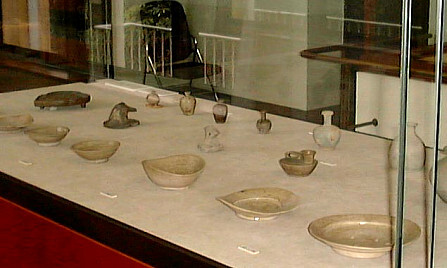 The gray bodied wares were also the first Japanese pots thrown on a wheel starting in the fifth century. 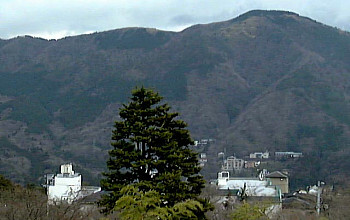 Sueki was fired until the 12th century. The so called 'Six Old Kilns' (Seto, Tokoname, Echizen, Bizen, Shigaraki, and Tamba) all derived in one way or another from the sueki tradition. Worthy of note are two rare dated pieces, an Echizen kame dated 1323 and a Tamba tsubo dated 1344. The second room features Ko-Seto works (top photo below) in the shape of mei'ping jars, which is called heishi in Japanese. 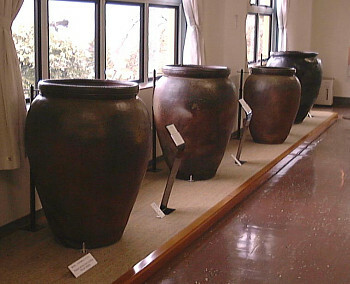 Seto is an important potting center in Japan, where the first ash-glazed pieces were fired around the 14th century. Some fine examples along with smaller Sanage wares are exhibited here (second photo below). Walking up the staircase to the second floor one is met by a large window that shows the natural beauty of this picturesque area. The room on the left is just fantastic! Stellar medieval tsubo from Bizen, Tamba and Shigaraki. Along the left wall are some king-sized kame used by farmers to hold water and/or process foods and sake. In the glass cases are classic Shigaraki tsubo (below) that farmers used centuries ago. The orange and buff-toned bodies are quite pleasing and the forms are organic and bold. 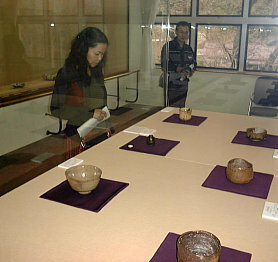 The fourth room showcases an Oribe ewer, a hybrid Mino-Iga mizusashi, and a large glass case in the center with chawan. Inside was a very rare Shigaraki chawan as well as a Ki-Seto, Takatori, and Oku-Korai ones. The Hakone Art Museum isn't large by any standards but offers a superb chance to see how Japanese pottery developed until the beginning of the Edo period. After leaving the main building a walk around the moss garden (see above photos) is pleasant and a cup of whipped tea in the Shinwatei tea house is a nice way to top off the visit.